Instagram / icoolkidjenkOz starts his mornings in the office. He had a role in an Idris Elba film, has appeared in Sky Atlantic’s “Fortitude,” has acted in West End theatre productions, and has even released his own music. However, there’s even more to the impressive pre-teen. For Oz, that means his day to day life involves interviewing celebrities, attending red carpet events, playing extreme sports, and DJing, all the while trying to get some great content for the site and his social media channels. 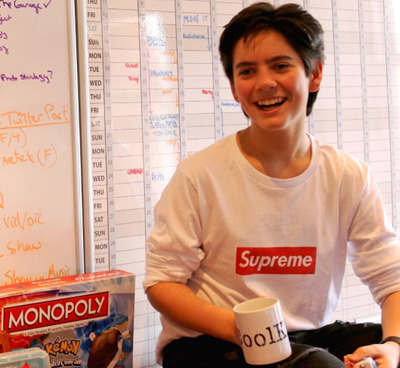 We caught up with Oz — and Greco — to hear about how the 12-year-old tycoon — who still attends school every day — fits it all in. 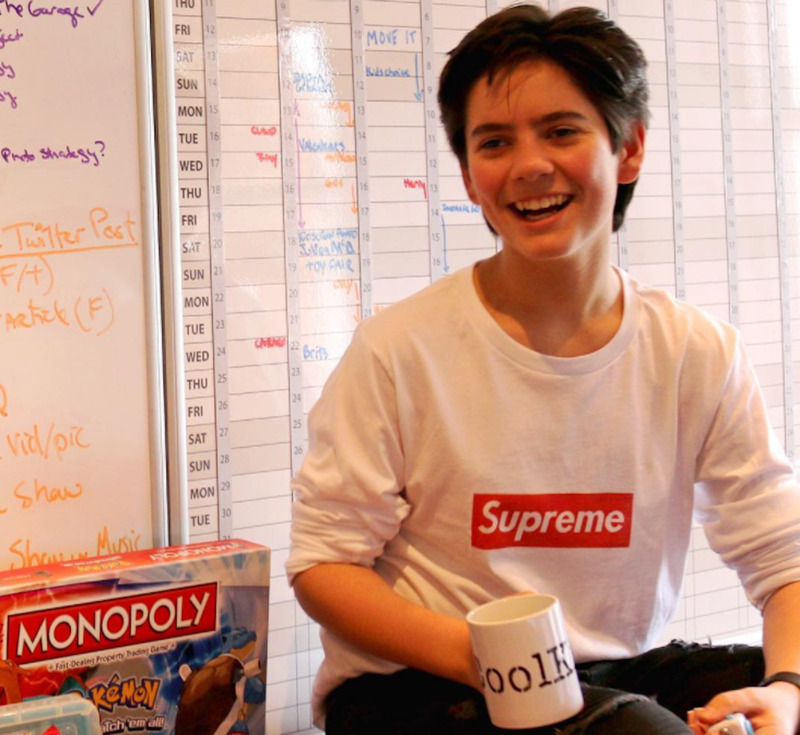 From running daily editorial meetings before class to mingling with James Corden, scroll down to see the insane life of 12-year-old Jenz Oz, the youngest CEO in Britain. 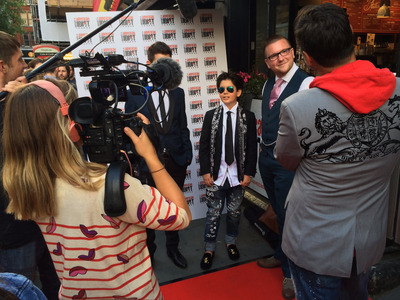 This is 12-year-old actor, singer, model, dancer, and musician Jenk Oz. He also happens to be Britain's youngest CEO. 'I've been performing since I was about four years old,' he told Business Insider. Needless to say, from a young age Oz was doing some pretty neat stuff in his spare time, attending performances and events and going to after-school classes. He wanted to share everything he was up to with all of his friends, and he presented the idea for the email update at a school Show & Tell. The newsletter -- which told his peers about the coolest extreme sports, games, music and sneakers (one of Oz' favourite things) was soon being shared across wider communities and schools by both kids and parents. 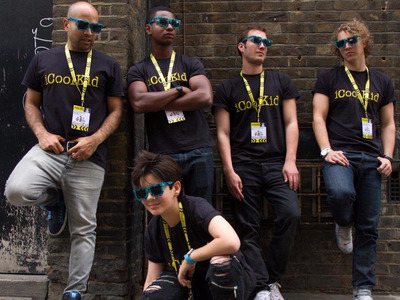 A couple years later -- in late 2016 -- iCoolKid was born as a digital publishing, media, consulting and production company providing original content for Generation Z. 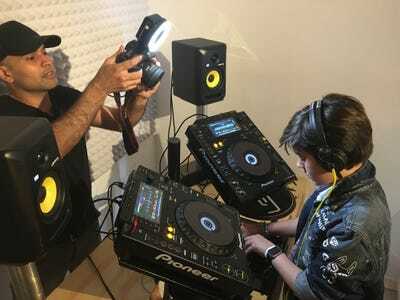 Now, the iCoolKid team works closely with Jenk and his friends to produce articles, previews, reviews, and features, as well as original music using state-of-the-art sound equipment. This means Oz travels to attend and cover pop culture and gaming conferences, movie premieres, exclusive live events, and to conduct interviews backstage. Greco said: 'I ended up liking his idea and becoming CFO for the company.' And the Canadian-born business woman certainly has the background to back it. She began her career in finance, working as a trader on the Toronto Stock Exchange before moving to Goldman Sachs in New York. 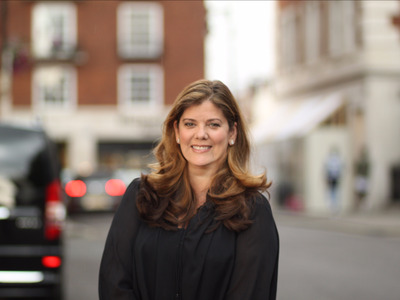 She moved to London with the company in 1999 and became its first female Managing Director in Europe in 2000. She has since had a stint as managing director at UBS before launching two medical companies -- biotech company Haoma Medica Ltd. in 2009, and Aventum Devices Ltd. in 2012. She is currently co-founder and CFO at both companies, in addition to her role as CFO at iCoolKid Ltd. Here's Jenk at the iCoolKid office, where he spends most of his time when he's not at school. 'I'm as engaged as I can be,' he said. The mother-son duo live in a converted office building in central London, which is where the company is based with a full-sized office and a filming studio. Oz has an office manager, an editor, two content writers, and a videographer on staff. Oz told Business Insider that he leads an editorial meeting every morning, and is constantly looking at the stories on the website. However, he's still in school every day. 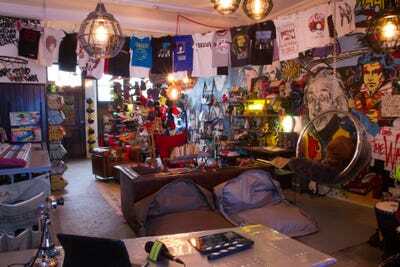 'At school, I find out what music everyone is listening to, what crazes are coming up, and there's a standard correlation between those two, so I'll write something on the website,' he said. He's also active on Instagram, where he shares what's happening on the weekend. 'He's out of school 5.5 months of the year, in 6.5 months, so it's almost equal time in and out,' Greco added, explaining how her son is able to fit it all in. It's cooler than your office. There's a full production facility at the studio, which helps the brand put out video for its YouTube channel, social media platforms, and website, as well as produce curated music playlists on Spotify and SoundCloud. Greco said that through their channels and reach, 'We've kind of become an expert on Generation Z. When you can access that demographic, you can ask them a lot of questions and get answers.' She added that she's now acting as a consultant to brands who want to use this type of information, whether it be for designing a new wrapper or producing a new juice box. The pair is also keen to show that the world of social media can be safe for kids. 'Social media wouldn't be anywhere near as popular as it is if it didn't have the positives,' Oz said. ...And takes some time to DJ. 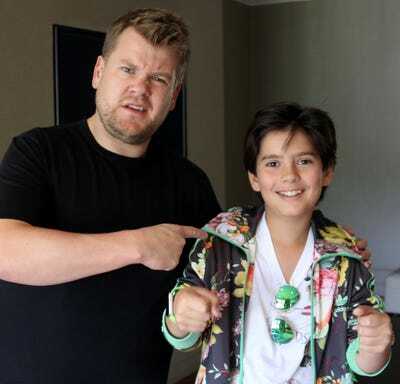 ...and met James Corden, one of his idols. He has also interviewed Gemma Arterton, David Haye, Hayley Baldwin, Dougie Pointer, and fashion designer Julien MacDonald. Here he is backstage at the London Fashion Week Julien MacDonald show. He's pretty keen on fashion, and plans to launch a clothing line. He's managed to attend some pretty cool events in VIP, such as Justin Bieber's concert at Hyde Park's British Summertime Festival. Someone's got to walk the red carpet. While being a CEO keeps him busy, he's also still focusing on developing his creativity. He was recently offered a highly-coveted place with the National Youth Music Theatre (NYMT) for the 2017-2018 season. 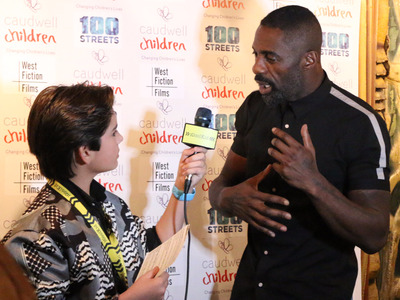 The project is supported by Andrew Lloyd Webber, and past attendees include Jude Law, Idris Elba, and Eddie Redmayne. 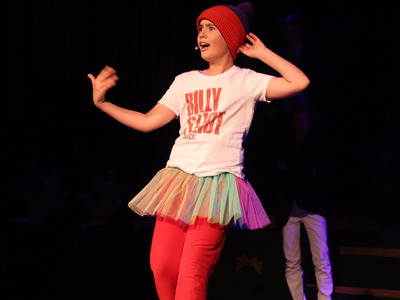 Oz is also studying at The Juilliard School of Dance, Drama and Music this summer. 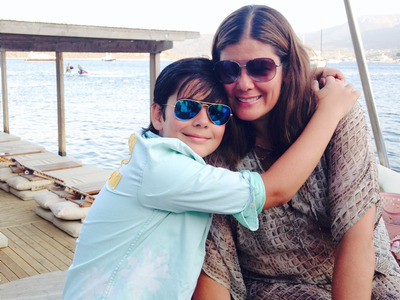 The well-spoken 12-year-old has been asked to give a TED talk in July on 'taking flight.' 'It's about getting your head to paper and executing your ideas,' he said. 'My motto is; try to follow your passions at every turn and think through your ideas every night before going to sleep. Then dream about them until they get so big and so colourful that you can't hold them inside anymore or you'll burst!' Oz said.